Combination of the Sontag Drug Store image, circa 1941 and a contemporary view of Wilshire Beatuy Supply. Justin Fields and his wife, Christine Haeberman, have lived in the Miracle Mile area since 2006. They first met in high school, but didn’t begin a serious romance until after college (thankfully, they admit, given the short shelf-life of most high school relationships). Justin’s father grew up in the area and it was sort of a homecoming when they found an apartment here. They enjoy walking around the neighborhood and were struck by how many of the places and landmarks featured in old family photos still exist. It was this connection between the past and the present that inspired them to combine their love of history and photography to create this collection of “Then and Now” images of the Miracle Mile. Justin and Christine utilized selected images from our Historical Photo Collection to document the past and then carefully replicated the angle and framing of those images to document how these landmarks appear today. As you can see, the pairing of old and new photographs vividly displays how the rich architectural heritage of the Miracle Mile is still very much in evidence. It also reinforces how critical it is that these historical structures are preserved – a cause that is important to Justin and Christine. “With all the changes coming to the Miracle Mile in the next decade – including the subway and the redesigns planned for Petersen Museum and LACMA – we wanted to capture our community as it exists now,” Justin said. Justin and Christine generously offered these photos for posting on the MMRA website. We liked them so much that we created this page. This will be an on-going series of paired images juxtaposing the past and the present – so, check in from time-to-time for updates. The MMRA is grateful to Justin and Christine for these fascinating photographs. Miracle Mile: Then & Now Photographs © 2013 by Justin Fields. All rights reserved. They may not be reproduced or distributed without permission. Wilshire Boulevard, circa 1963 & 2013. Top photo: Windshield view from a car driving east along Wilshire Boulevard, circa 1963. The Muellen and Bluett store is on the right is decorated for the Christmas holiday. The white vehicle is a 1963 Ford Falcon. Looking east along Wilshire Boulevard @ Cloverdale, 1954 & 2013. 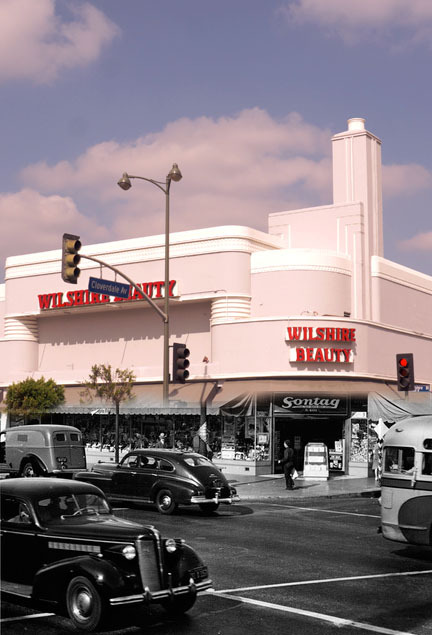 Combination of the Sontag Drug Store image, circa 1941 and a contemporary view of Wilshire Beatuy Supply photographed by Justin Fields. Combination of the Desmond’s building and Wilshire Boulevard, 1936 with a contemporary view by Justin Fields.